Loire LED bath light . 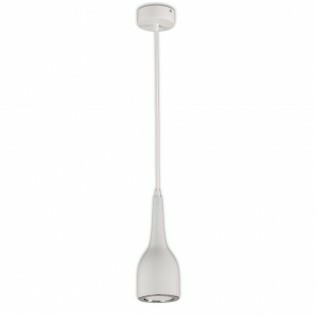 It is made of chrome finished aluminium with opal acrylic diffuser. It has a switch on one side to be able to turn it on directly. It can be installed on the wall just above the bathroom mirror thanks to its IP44 rating. Dimensions: Height 5,3 cm. Length 60 cm. Width 6,5 cm. Smart ceiling light with a light point. This original shaped ceiling light will look great in any room of your home. As it is compact, it is advisable to place several Smart ceiling lights aligned on the same ceiling. To illuminate areas of the living room, dining room, bedroom, hallways and hallways. Dimensions: Height 10 cm. Diameter 15 cm. 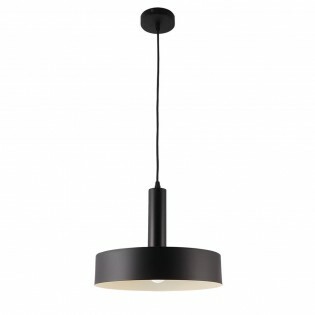 Tinia ceiling-mounted light classic style. The opal glass lampshade has a glass decoration in the central part. The decoration is a geometric detail that creates a different lighting effect. It is a ceiling that will illuminate your living room, dining room or bedroom. Dimensions: -Small: Height 9 cm. Diameter 30 cm.-Large: Height 13.5 cm. Diameter 40 cm. LED ceiling light Star modern style. Made of acrylic with a white metal frame. The acrylic has tiny dots that allow the LED lighting to pass more directly, as if it were a starry sky. It is ideal for illuminating living rooms, dining rooms and bedrooms. Dimensions: - Small: Height 8.5 cm. Diameter 47 cm. - Large: Height 8.5 cm. Diameter 57 cm. Dominica LED Ceiling Lamp modern style and innovative design. It consists of curved pieces of silver-finished aluminium that are joined at the ends to create a series of inclined circles. It is perfect for illuminating living rooms, dining rooms and bedrooms. Dimensions: - Small: Height 25-180 cm. Diameter 55 cm. - Large: Height 25-180 cm. Diameter 76 cm. 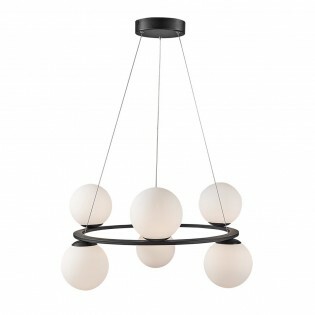 Six-light LED pendant lamp Kin ..It is made of metal with black textured finish and spherical tulips of methacrylate. The six lampshades are distributed along the structure up and down. The six lampshades are distributed along the structure up and down, with this structure is better distributed lighting.Dimensions: Height 150 cm. Diameter 65 cm. 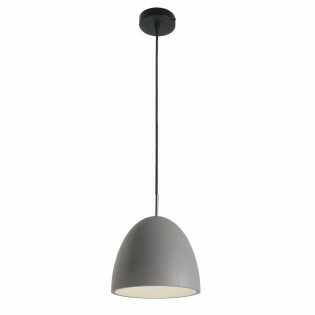 Samoa LED pendant lamp modern style. It consists of ovals joined together in the shape of a flower, the petals being each of the LED light rings. It has five light rings made of metal with methacrylate diffuser. It is perfect as a ceiling lamp for living room, dining room, bedroom and large areas of your home. Dimensions: Max height 150 cm. Diameter 60 cm. LED Ceiling Light Studio modern style. The base of the lamp is a cylinder with an under light point, available in black and white. It is an LED COB hanging lamp ideal for placing in living rooms, dining rooms, kitchens, hallways and passageways of your home. Dimensions: Height 34-140 cm. Diameter 7 cm. LED pendant light COB Tai modern style. It is made of acrylic and aluminum available in two finishes. The original and decorative shape is ideal to illuminate any room in your home. COB LED lighting is perfect for lighting living rooms, dining rooms, corridors, passageways and bedrooms. Dimensions: Height 30-160 cm. Diameter 11 cm. Modern style lamp Nintu . 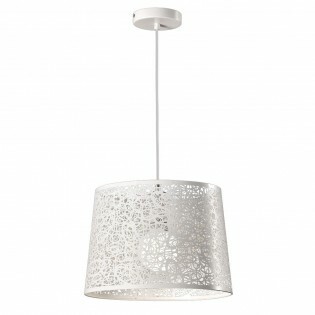 It has a metallic lampshade and a fleuron, both in white finish. The design of the lampshade simulates a forest of trees, allowing light to pass through the empty spaces. 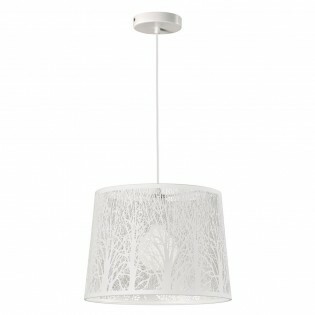 This creates an original lighting effect that will be perfect in bedrooms, youth bedrooms and living rooms. Dimensions: Max. height 140 cm. Diameter 35 cm. Modern LED ceiling lamp Shiitake . It is made of black metal, contrasts with the gold colored interior creating a perfect combination of tones. 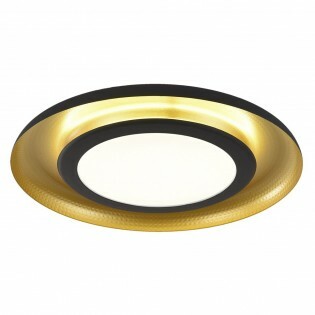 Its circular ring shape with LED lighting is ideal for illuminating living rooms, dining rooms, bedrooms and large areas of your home. Dimensions: Height 30-145 cm. Diameter 70 cm. Chandelier from the Maui collection . It has five points of light supported by metal bars. The lampshades are made of opal crystal and the body of the chandelier is made of metal with an old gold finish. It is perfect for large living rooms, dining rooms and bedrooms. Dimensions: Height 120 cm. Diameter 40 cm. 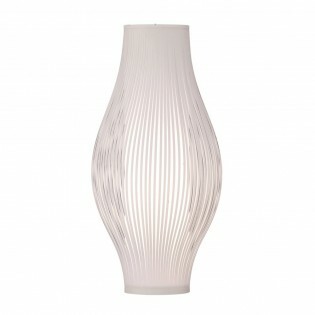 LED floor lamp from the Dominica collection . 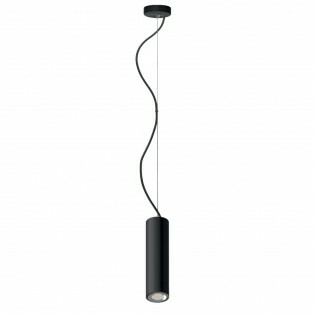 It has a LED lighting with a slight curvature, which gives it a modern and elegant style. It is made of aluminium in silver finish with methacrylate diffuser. It is an ideal floor lamp to illuminate living rooms and bedrooms, as well as large areas of your home. Dimensions: Height 152 cm. Diameter 23 cm. Floor lamp Murta modern style. It consists of an acrylic cylinder with a white textile decoration in the form of vertical strips. The textile decoration creates a unique ambient lighting effect. 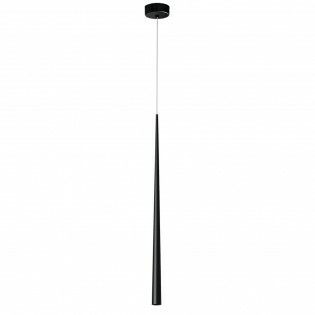 It is a floor lamp for illuminating living rooms, dining rooms and bedrooms. Dimensions: Height 71 cm. Diameter 35 cm. 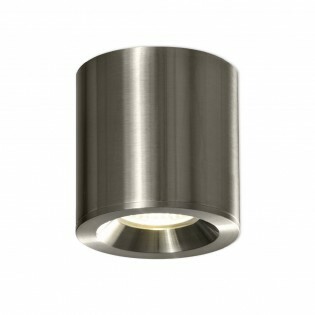 Vanduo ceiling flush light cylindrical. It is made of metal with three different finishes and glass. The white, chrome and satin nickel finishes are ideal to combine with any room in which you place it. 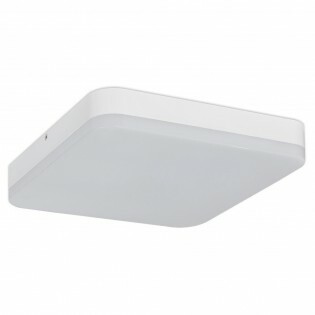 Perfect for placing on the ceiling of your bathroom thanks to its IP54. Dimensions: Height 8 cm. Diameter 8,2 cm. 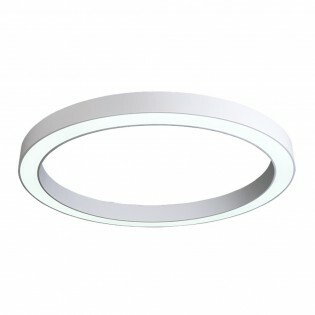 Areli LED Ceiling light made of white opal acrylic. It has two LED bars attached by a rectangular base. The simple design of this ceiling makes it possible to distribute the lighting throughout the room. It is an ideal lamp to place in offices, kitchens or any other large room. Dimensions: Height 5 cm. Length 120 cm. 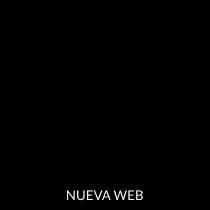 Width 9,5 cm. 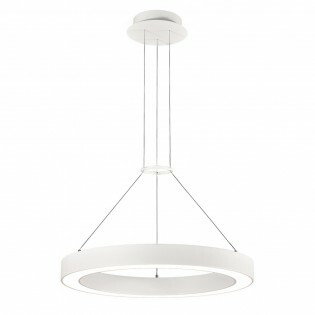 LED ceiling light from the Dominica collection . It is made of aluminium and methacrylate, achieving a minimalist and modern design. 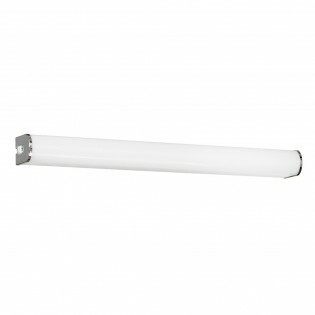 Each of the LED lighting bars are curved to form an elegant circumference. It is a perfect ceiling for living rooms, dining rooms, bedrooms and passageways. Dimensions: Height 20 cm. Diameter 55 cm. LED flush light from the Kyoto collection modern style. Overall it has a stylized design thanks to its square shape with rounded edges. It is made of metal with a textured white and methacrylate finish. It is an ideal ceiling panel for illuminating living rooms, dining rooms, corridors and passageways. Dimensions: Height 11 cm. Length 45 cm. Width 45 cm. 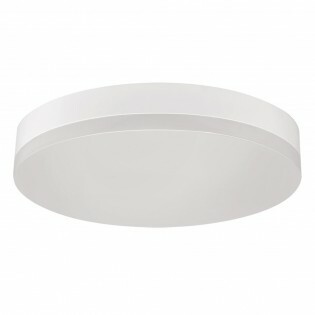 LED Madison Ceiling Flush Light . Circular shape and made of white acrylic. You can select between three colour temperatures, it can be placed in any room of your home. On the other hand it can be installed in bathrooms and exteriors thanks to its degree of protection IP 54. Dimensions: Height 6,2 cm. Diameter 28 cm. Samoa LED ceiling light modern style. 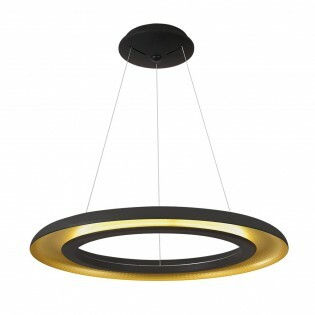 It has three oval-shaped LED light rings, supported on a metal base. It is made of metal and methacrylate with a white textured finish. It is a ceiling of original form that fits with rooms of your home, like lounges, dining rooms and bedroom. Dimensions: Height 8.5 cm. Diameter 54 cm.